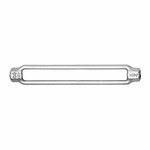 Forged turnbuckle bodies are commonly used in structural rigging, or engineered rigging systems. The body receives threaded rod perfectly, which can then be capped with an eye nut or clevis fitting. While these bodies ship without end fittings, they are head-treated and made from forged steel just like the rest of Crosby's turnbuckles. They satisfy Federal Specifications FF-T-791b, Type 1, Form 1 - CLASS 2. They are hot galvanized and offer a 5:1 safety factor.